The Wireless Society of Southern Maine participated in their second annual Field Day on the weekend of June 23rd - 24th at the Wassamki Springs Campground, in Scarborough. Even with a few minor setbacks, which included a broken antenna, and a two hour delay due to a severe thunderstorm, the WS1SM team beat last year's points total and equaled the number of QSO's! 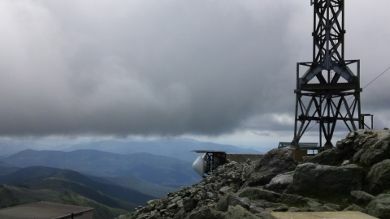 On July 8th, WSSM members, Thom Watson W1WMG, and Tim Watson KB1HNZ, made the trip to the highest point in New England to activate W1/HA-001 for Summits on the Air. Using the club call, they made many contacts on VHF, while braving hurricane force wind gusts and 35 degree temps. In early June, several club members helped Dave KB1FGF, install his new HF vertical antenna. 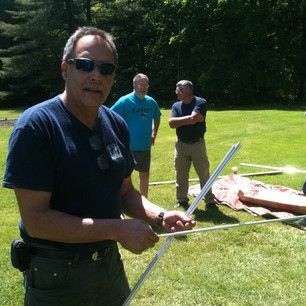 Dave's antenna was mounted on an eight foot galvanized steel pipe, that was driven about four feet into the ground. Also installed was a remote antenna switch. Click on the link below to see more photos from the antenna party. 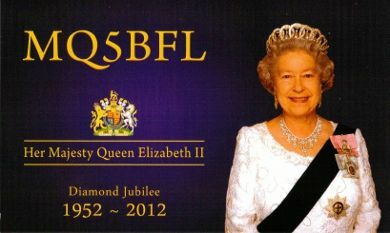 Here's an interesting QSL featuring a special prefix commemorating the Diamond Jubilee of Her Majesty Queen Elizabeth II. 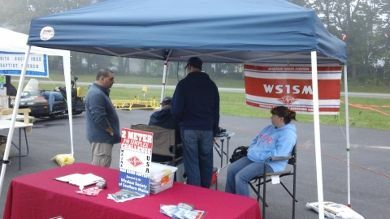 Just after publication of our last newsletter, WSSM set up an information display and operated a special event station at the Gorham Founder's Festival. This year's festival, being condensed from four days to two, saw much larger crowds and fine weather. We were visited by many members , many who helped set up. Roger N1XP, even dropped off some homebrew QRP transmitters to show off. 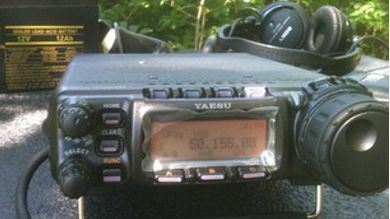 The current edition of the Yaesu FT857D is still the smallest HF/VHF/UHF transceiver on the market that is capable of 100W output. Its an ultra-compact package that packs many of the bells and whistles you'd expect to find on more expensive, larger radios. We tested one during the CQWW VHF contest from the summit of Mt. Megunticook, and were pleased with it's performance. One useful feature that we immediately noticed is the voltage meter, located on the top right corner of the display. This is especially useful when running on battery power (which we were). The receiver is good, but not quite as sensitive as my Icom IC706MKIIG. It also features a WFM receive, so it can be used to tune FM broadcast stations. The FT857D includes digital signal processing (DSP), which is helpful in filtering out some noise, but seems to work better on CW than on SSB. The DSB band pass filter peaks the CW signal while cutting adjacent interference, improving the overall readability. On SSB, noise can be improved somewhat to pull out weaker signals, but don't expect the noise filtering of a full blown base station. As far as aesthetics go, the biggest complaint I hear is that the radio has a very small display. This is true. Some people may even find it difficult to read, but I didn't find it that bad. The small screen is efficient and displays exactly what you need to know. It has dot-matrix style numbers which are a little ugly. One interesting feature is that you have the option of changing the background color. The large VFO knob has a really nice feeling, and the rest of the buttons and knobs are comparable to other rigs of the same size. Operation of this radio is menu based, minimizing the need for buttons to perform its many functions. Don't be intimidated by the menu system or memory programming, however. It takes a very short time to memorize its operation, and you'll soon find that there's no need for cheat sheets or constant checking of the manual. The FT857D also features a removable head for mobile use, with an optional seperation kit. Although it is well suited for use in the shack as a base station, this radio is ideal for backpacking and portable operations. If you factor in the price, convenience, and features, this rig is tough to beat. August 9th - at 7PM-9PM at Wassamki Springs Campground. September 13th - at 7PM-9PM at Wassamki Springs Campground. 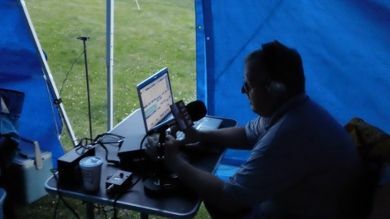 On the weekend of July 14-15, Tim Watson KB1HNZ, took part in the IARU HF Contest, operating portable QRP from Tunbridge, Vermont. I come across these articles all the time about the latest record breaking ham radio contester, with his big amplifier, stacked beams and perfect QTH, located on the slope of a panoramic ridge that just happens to also be in a rare grid square. Unfortunately this does not apply to me... or anyone I know, for that matter. The politically correct answer that we’re provided is: “The rules of a ham radio contest are primarily designed to give operators a chance to compete on an even basis, and have fun doing it.” ... or, my personal favorite: "the most important thing is not to win but to take part, just as the most important thing in life is not the triumph but the struggle. The essential thing is not to have conquered but to have fought well.” Wait. That’s about the Olympics. Never mind. They tell us that the reason these operators have such monumental scores has nothing to do with their 200' towers, stacked beams, broadcast studios and $14,000 radios. Instead, it is entirely because of their godlike operating skills. But, in place of detailing what some of these skills actually might entail, we're flashed a few more pictures of their beautiful “shacks,” complete with marble counters, twin 32" monitors, and a full service bar. Working without the benefit of all that crap means you have to contest the old fashioned way. In other words, you have to earn it! So, I set up my BuddiPole in the Tunbridge Fairgrounds in a valley somewhere in Vermont and operated QRP during the IARU HF World Championships. In the first hour I was totally frustrated. I wanted to throw my microphone at somebody, but thankfully there was no one around. I realized that I had to learn new ways of working a station, getting that multiplier, and busting that pileup. After a while I became less frustrated because a couple of things I was doing started to work, and I began putting stations in the log. And at the end of the first day I figured out a lot about what the propagation had to be in order to work a station, how loud a signal had to be on the S-meter before they could hear me, and whether or not tail-ending, or calling off-frequency worked best. By the end of the second day I was really in a groove, clicking off several QSO’s a minute. I had found new ways of working stations and felt comfortable doing it, which is why I felt like some learning had actually taken place. I’m not sure if what I did proved anything in the end. Operator X will still get more QSO’s than the total number of licensed amateurs in the world, and I’ll have sunburn... But, at least I earned it. Maybe that quote about the Olympics is true afterall.